Damper Motors Archives - Temco Controls Ltd. This 3-point floating type damper actuators use brushless DC motor,which is a smart design and has high IP class,widely used for damper control in HVAC system. 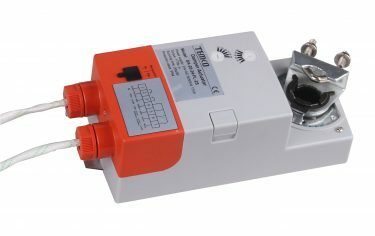 The Actuator is intended for ON-OFF and floating point controls in HVAC systems. It can easily mount on a 1/2″ round or square shaft with solid screw sets. Angle of rotation is mechanically limited to 90 degree. When the actuator reaches its maximum position, the device will automatically stop. An override lever is provided on the side to manually disengage the gear. Two mechanical stops are provided for extra adjustments.